At a recent Stutter Social Hangout, I had the chance to witness a powerful moment of courage. It was two weeks ago, but the impact still resonates. Real quick, a hangout is a virtual group video chat where up to 10 people can talk with each other about stuttering, or anything for that matter. I host a Hangout every other Sunday, which lasts for 90 minutes. People are free to “come in” when they can, and stay as long as they wish. There are no time pressures. As a host, I try to welcome people as they come in, and if they are new, facilitate introductions, just like we would at a real-time support group. As we know, introductions can be very stressful for those of us who stutter. The pressure may be magnified for some because we use microphones and video. A newcomer, Sydney, joined the hangout and during a lull, I welcomed her and asked her to introduce herself to the group of about 8. Sydney found herself in a mighty, stubborn block as she attempted to say her name and where she was from. We could see her effort and struggle as she stopped and started several times. The darn block was digging in its heels. Sydney stayed with it, for several minutes, and maintained eye contact and a smile. You could feel the energy of the 8 of us who waited for Sydney. That energy seemed to fuel Sydney as she stayed courageously in the moment and waited out the block and she told us her name and where she is from. Sydney smiled, we all smiled and we carried on in conversation. What a moment of courage! Maybe not to the average person who doesn’t stutter, but it was. A powerful moment of courage and self-truth. It would have been so easy for Sydney to give in and not stay with it. But at that moment, Sydney showed the rest of us a quiet moment of grit, persistence and courage. And she won – not that darn block! I was glad I was there to see it. Go Sydney! From the Free Online Dictionary, the meaning of the word interrupt and it’s different forms. 2. To hinder or stop the action or discourse of (someone) by breaking in on: The baby interrupted me while I was on the phone. I think about the times I get interrupted. In the middle of a block, someone interrupts and fills in the word they think I was going to say. I sometimes feel disrespected when that happens. I also think about how many times I actually interrupt another person who stutters, as it’s not always easy to tell when a person who stutters is done speaking or if they are in the middle of a block. It seems to happen a lot when I am chatting with someone over Skype for the podcast. I usually wind up just apologizing and acknowledging that sometimes it just hard to gauge if the person is done speaking or indeed in a block. Sometimes it’s hard to establish a rhythm between two people who stutter who are engaged in good conversation and good blocks. Has it happened to you, that you accidentally interrupt someone who stutters while they’re in a block? How does it make you feel? Episode 112 features Rachel Dancy who hails from Saginaw, Michigan. Rachel works as a job coach at Do-All, Inc. which is an agency that supports people with developmental disabilities. Listen in as we discuss how Rachel chose her field of work and the importance of having a supportive work environment. 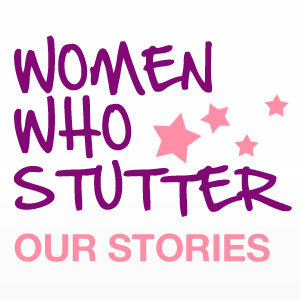 We talk a bit about negative reactions to stuttering and the best ways to handle them. We also hear from Rachel’s boyfriend, Rick, who shared his point of view on being the partner of someone who stutters. We discuss interrupting and why that happens from time to time. This was a very honest and insightful conversation and it was great getting to know both Rachel and Rick. The podcast safe music clip used in this episode is credited to DanoSongs. I had one of those intimate stuttering moments today. You probably know what I mean. I say intimate in that I was looking at the person I was talking to as I blocked and we maintained eye contact through the block. Neither of us averted our gaze. Our eyes just kind of locked, until I was able to finish the word and then move on. I then glanced away for a second and then glanced back, which I think is normal eye contact. The other person did too. Well, stuttering can be very intimate. In a Google+ hangout recently, David, a co-founder of Stutter Social, discussed his view of the “intimacy of stuttering.” It’s my view too. Getting locked up in a block for a few seconds and sharing that with another person is very personal. I showed my “imperfection” in a vulnerable way. And to have the other person share that with you, as in maintaining eye contact, until the block is over, is extremely personal. Staying with me in the moment was also a deep sign of respect. We shared that very personal moment that was important enough to me to write about this today. My friend asked me to raise this question on Facebook. Do people who stutter tend to stutter more when talking with people who talk very fast? The question got a lot of responses. Many indicated that the pressure to speak faster increases anxiety, which then increases the stuttering. Some said they know they can’t keep up, so they just don’t say anything, hoping the other person will notice eventually and invite them to respond. Some said they speak even slower to encourage the fast talker to slow down. Some said the pressure to keep up brings on more blocking. I sometimes wonder where in the conversation it would work for me to jump in, as I worry I might block at that moment when I try to break into the conversation.